Supplies of both the LeapPad Green and Pink are currently good. Our servers are constantly tracking retailer websites ensuring you are the first to know when Leappad stock is found. We can also send you email and SMS text message alerts by registering your details. During periods of shortages online retailers can sell out very quickly (sometimes in literally minutes), we therefore provide you an accurate up to the minute analysis of UK retailers. Our servers are constantly checking for LeapPad stock, so you don't have to. 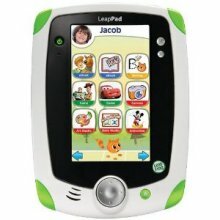 The LeapFrog LeapPad has introduced a new generation of electronic learning and gaming to children. Designed with kids in mind, it's child friendly, sturdy, wipes clean and can withstand rough play. It's lightweight and sleek with a 5" screen that works whichever way up you hold it, just like an adults more expensive tablet. It boasts a large library 100+ games, apps, e-books and videos all downloadable via a USB connection to a PC. This leaves the parents in complete control as to what content is added and thus protecting their credit card! It also does not have any internet connectivity, ensuring online safety and no nasty surprises of inappropriate content being accessed. Education is at the forefront of games which boosts basic skills in many school subjects. Learning is based on having fun! The e-books read words aloud to help reading and spelling. Let your childs imagination run wild the the Annimation Studio, creations can be shared with friends and family when connected to a computer with internet access. A built-in camera lets you take and edit pictures, the video recorder means you can create music videos and films. You can then personalize your LeapPad with photos, drawings, audio, wallpaper and names. Existing LeapFrog cartridge games are compatible can be inserted into a slot on the top of the LeapPad ensuring previously purchased software does not go to waste. Parents can check on the progress of their kids learning with the online tool 'LeapFrog Learning Path' which shows which activities, stories and games are being played. The Box Contains the LeapPad Explorer Handheld, with two pre-loaded game and one downloadable game, Parent Guide, USB Cable and Spare Stylus. Requires 4 x AA batteries (not included). Suitable for ages 4-9. 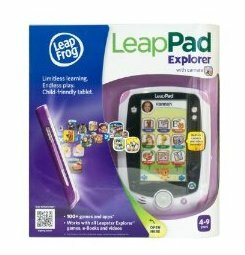 "thank you soooo much for your email today regarding the leapfrog leap pad, i have been trying to buy this item for four weeks only to find they have been sold out everywhere or that the prices have been raised! i have just ordered one from amazon and im delighted, once again i'd like to thank you for enabling me to buy one for my son. clare larkman"
"Great site. Due to your e-mails I was able to get hold of a Leap Frog Leap Pad very quickly and at a good price. Thank you." "thanks stock informer, thanks to you i have purchased a pink leappad from amazon for my daughter i am one happy bunny! Will definatley use stock informer again and recomend you to my friends"
"I found this site by accident but what a find! After a few weeks searching the net endlessly for a Leappad (Green) I managed to get one the first time I used the site. Amazing! Another very happy boy this Christmas! Have been recommending the site to friends and family. Will definitely use again. Thank you very much! :0)"